Both had 8 years in office; 2 terms each. Why The Chinese New Years? By looking at 2008 ... the Year of the Earth Rat; you can compare what the Indicators had to say for that year and then weigh their accuracy against what actually happened. Then .... look at what the indicators had to say for 2009, the Year of the Earth Ox and see how accurate those Indicators are turning out to be! 2011: The Year of the Metal Rabbit began on February 3rd, 2011. POINT IS THIS: The Chinese New Years can give some insights into what was going on while YOU were living thru it all. Maybe, then you can get a sense of what might be coming. as Obama is Elected President. In Rat Years; things start out in "deceptive bounty" but; then soon turn into "Poverty"
Rat years are the "Economic Calm & Speculation" before Financial Storms. "Rat" is a "gambler" and whatever is gained at the beginning or first half of Rat Years is often lost at the end. Rat Years tend to see Speculation and people over-extending themselves. Note: Before Bush left office, the economy went south in abig way. People were literally wiped out or had their income cut in half. Ox Years bring the need for Hard Work and the "Yoke" of Responsibility. Ox Years bring the need to settle "Domestic Affairs" and the need to "Put One's Household Affairs and House in Order" . The Ox Year can also be marked by the Rise of Dictators. Thee can also be a discovery that those in authoritiey may not turn out to be as "compassionate" as one would like (nor have imagined them to be). Finally; Ox Years are supposed to be good for "Harvests". So, this year might be a good year for a Vegetable Garden! Note: Michelle Obama did in fact, start a White House Vegetable Garden...accompanied by lots of Press Coverage. Bush appoints Samuel Alito (replacing Sandra Day O'Connor, who retired in 2005) . Feb of 2016: Supreme Court Justice Antonin Scalia died under very odd circumstances (some say "very odd") . Official: Scalia died in his sleep from natural causes. His body found in his room at Cibolo Creek Ranch in Shafter, Texas; on the morning of 13 Feb. 2016. Obama has already appointed 2 liberal activist Supreme Court Justices. If he gets to appoint one more before leaving office; and Hillary replaces Obama as President ... then ... Hillary could appoint any who retired or died during her term in office. Liberal: Ginsburg, Sotomayor, Kagan & Breyer + Scalia's replacement would = 5 Liberal Activist Justices on the Supreme Court. and...the court would have ended up with a majority of liberal activist Justices. -1 Scalia's death leaves opening so will the Liberals get 5 or the Conservatives gain 3? Congress held off on Scalia's replacement ... Trump was elected President in 2016...preventing what would have amounted to a "coup" of the Judicial Branch. 2017: (Fire Rooster Year) Trump appoints Neil Gorsuch (replacing Scalie who died in office). so now the count is Liberal: 4, 2 Swing Votes, & 3 Conservatives. With Trump as President, any replacements would be a plus for the Conservative side. Below are the 8 years of the Bush Presidency in terms of the Chinese New Year. Note: People began to finally take "notice" of the "Chemtrail skies" around 2004. The Sun began to "burn hotter" between 2000 & 2004. Compare the Chinese Indicators with the actual occurrences of the Bush Years. Then ... take a look at what came up for Obama; throughout his first 4 years in office (he was re-elected for a 2nd term in 2012). Bush's First Term which included "911"
"Cataclysmic Events", "Revolution", "Financial Depression"
"Spending like a drunken sailor"
during a Water "Sheep Year"
"Political & Financial Ups & Downs"
"A Last Minute Snatching of Victory from the Jaws of Defeat"
"A Year of Improvisation" when "anything can happen"
"A Year of Disorder, Military Successes & Bloodshed. 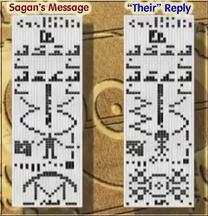 During an Earth "Rat Year"
"Apparent Prosperity" followed by "Poverty"
Sagan's Original message was sent on 16 Nov. 1974 ... Under President Gerald Ford ... who had just replaced President Richard M. Nixon. Nixon had resigned & left office on 09 August 1974. 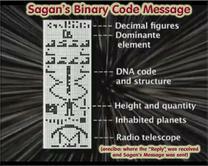 The message was broadcast into space a single time, via frequency modulated radio waves. 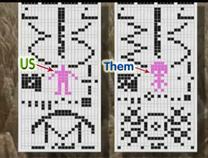 It was sent to Star system/galxy M13 (25,000 Light Years away). So, President Ford sent the call, and President George W. Bush got the call back. Obama was elected in the Rat Year that ended Bush's last year in office. So in effect, Bush handed off a "Rat Year" to Obama ... and he accepted it. Obama's first term as President begins in the Year of the Earth Rat ... as Such, Obama's First Term in Office will be (Overall) ruled by the RAT. Obama was also sworn in during the Year of the Rat. For Obama, his first term in office is served in the Year of the Ox which began on Jan 26, 2009. During an Ox Year, Dictators are said to rise. Is this Obama? Or: does this mean Obama will encounter, or; have to deal with a Dictator, before this year is over? Or Both? "Dictators were definitely on the Menu during the Arab Spring..."
President of Poland, Lech Kaczyński, is among 96 killed in plane crashe near Smolensk, Russia. South Korean Navy ship, Cheonan sinks, killing 46; North Korea blamed, they deny allegations. Protests in Bangkok, Thailand, kill 91 and injure more than 2,100. 2010 Ahmadiyya mosques massacre in Lahore, Punjab, Pakistan, 94 killed. Ethnic riots in Kyrgyzstan between Kyrgyz and Uzbeks result in the deaths of hundreds. GULF of MEXICO: Deepwater Horizon oil drilling platform explodes in the Gulf of Mexico; damaging waters & coastline. Standard & Poor's downgrades Greece's sovereign credit rating to junk... 4 days after €45-billion EU–IMF bailout; triggers decline of stock markets worldwide ... the decine of the value Euro and a European sovereign debt crisis. INDIA: Air India Express Flight 812 overshoots the runway at Mangalore International Airport in India - 158 killed, 8 survivors. LIBYA: Afriqiyah Airways Flight 771 crashes at runway at Tripoli International Airport in Libya - 103 killed. ARAB SPRING BEGINS: Attempted suicide of Mohamed Bouazizi, street vendor in Tunisia, sets himself on fire & triggers Tunisian Revolution & Arab Spring throughout Arab world. The rabbit is a more or less "liberal" animal. Not real strict on laws, rules, & regulations. NOT GOOD for Securing or Enforcing Borders or Stemming the Tide of Illegal Immigration. The Rabbit wants to be able to "take it easy". Of course, the Metal Rabbit is made of "sterner stuff" as far as rabbits go. Metal Rabbits are more like Sherlock Holmes than Dr. Watson. Metal Rabbit wants and knows the "higher end" of goods & services and will be more discerning in general. He likes the Arts, & Refinements that Culture has to offer. Romance, Culture, Art, Music, Leisure time ... all are Metal Rabbit Pursuits. Metal Rabbit likes Privacy ... he likes to be alone with his thoughts ... and he can occasionally ... take on walk on the dark side ... Artistic Types are prone to be a bit "brooding" .... a bit on the "Heathcliff-Wuthering Heights" side of life. Lastly ... unless this rabbit feels "inspired" to do so; he is unlikely to take any action. 9.0 earthquake & tsunami hits Japan destroys Fukushima nuclear power plant. Protests breakout across Syria demanding democratic reforms and the resignation of President Bashar al-Assad; Syrian Civil War Begins. NASA: Space Shuttle Atlantis lands at Kennedy Space Center ending NASA's Space Shuttle program. LIBYA: Tripoli captured & Muammar Gaddafi overthrown...killed in Sirte. TURKEY: 7.2 Mw earthquake hits near Van killing 600. NORWAY: Twin terror attacks in Oslo & UTOYA ISLAND. 101 dead. Utoya Shooter: Norwegian citizen & Freemason Anders Behring Breivik - concerned that multi-culturalism had gone beyond an ideology and had become an Agenda ... designed to to deconstruct European culture, traditions, identity and nation-states. RAPID CHANGES in the EARTH'S CORE: In June of 2008, Nature Geoscience Journal published findings of Nils Olsen (Senior Scientist with DTU Space) & several German Scientists regarding rapid changes within the Earth's core. The movements in the liquid part of the Earth’s core are changing surprisingly quickly, and this affects the Earth’s magnetic field. Question was ... what is at the center that is "shaking things up" at the Center of the Earth? At the end of 2010 and the beginning of 2011; it was announced that at the Tampa Airport, Runway 18 had been re-named Runway 19 due to a 10 degree shift in the Earth's magnetic Field. 180 degrees magnetic north had shifted to become what was 190 degrees north. Also at the end of 2010 ... and continuing through 2011 ... worldwide, incidents of large scale animal, bird, & marine deaths have been reported. Costa Concordia Cruise Ship sinks off the coast of Italy - 32 dead. Captain Francesco Schettino found negligent. FBI shuts down Hong Kong-based file-sharing website Megaupload. Greek government-debt crisis - Greece gets a 2nd €130-billion bailout. Tokyo Skytree, the tallest self-supporting tower in the world at 634 metres high, is opened to the public. Aurora, Colorado Theatre mass shooting. James Holmes kills 12 & injures 58 during "Dark Knight Rises" showing. INDIA: Worst Power Outage in World History; 620 million people without electricity. Terror attacks against U.S. Diplomatic Embassies in: Germany, Switzerland, United Kingdom. BENGHAZI, LIBYA: 11 Sept. 2012: U.S, Ambassador to Libya ... Chris Stevens ... murdered, rescue requests delayed & denied. Despite being obstructed, Independent Contractors risked their lives to save who they could. CONNECTICUT: Sandy Hook elementary school shooting 27 killed. THE MAYAN CALENDAR ENDS - Time is supposed to mark an uptick in volcanoes and natural catastrophes with the return of the "gods" (space travelers).